It feels like the Three Musketeers has been a part of my cultural consciousness for almost as long as I have been alive. Whether it was the animated version that formed one of the segments in the Banana Splits show (re-runs I hasten to add), the Tom and Jerry classic “two mouseketeers” sequence or even the later Dogtanian and the Three Muskehounds, the Dumas classic reaches way beyond the bookshelves to hook in the younger reader. So, even when I first came to read the book many years ago, I was already familiar with the tropes found in it. Long before I accompanied D’Artagnan to Paris, it was axiomatic to me that “all for one and one for all” was a motto to live by. This kind of implicit familiarity with a book I had never read interests me greatly. There are many books that are so central to our collective Western heritage that most of us have absorbed their basic plots and are aware of the main characters even without having read them. The Iliad, the Odyssey, Oliver Twist, the Three Musketeers, A Christmas Carol are just some of them – I am sure you can think of others. This begs the question of what it means to have read a book. If, for example, I read a book a number of years ago – the Children of the New Forest would be a good example – but can remember absolutely nothing about it, can I really say I have read it other than as a literal statement of fact. I can’t discuss it with anyone and have no lasting appreciation of it. At best, I can put a line through it in a list of books. By contrast, I could converse sensibly on aspects of the books I’ve listed above even before I had read them for the first time. In any meaningful sense I had more knowledge and understanding of books I had not actually read than some I had technically read. In the sense that I think a lot of us use the phrase “I have read” - i.e. I am familiar with the plot, the characters, the ideas and the place in history of this book – I’ve actually “read” the books I haven’t and vice versa. On this basis, the act of transporting words from page to brain via eyes seems to be just a small part of “reading”. I shall soon be reading How to Talk About Books You Haven't Read by Pierre Bayard which examines the meaning of reading in greater depth and, hopefully, will have a bit more insight into this thought. Anyway, I digress. Let’s return to Paris at the turn of the 17th Century. 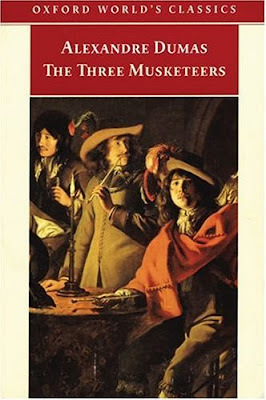 In taking part in Allie’s readalong at A Literary Odyssey, I wanted to explore whether The Three Musketeers would give me the same pleasure that it gave me as a child all those years ago when I first read it. Way back then, I found it an exciting, swashbuckling adventure in which I was firmly on the side of the impossibly brave and honourable D’Artagnan and his three loyal friends, Athos, Porthos and Aramis. This time? Not so much. It’s still a breezy read but, at the halfway point, I am finding myself becoming slightly disgruntled with it all. My real problem with it lies in the moral and social code that the main characters display. I’m not talking about things like their views on gender, race, politics or the “big” issues but, instead, I’m really focussing on their day to day personal behaviour and the kinds of behaviour that are considered “honourable” or that are expected of gentlemen of quality. I should qualify this by acknowledging that Dumas was writing a story set over 200 years earlier and so we are seeing his interpretation of the moral code of the 1600s. He may even be exaggerating the differences to contrast with the values of mid-19th Century France. Maybe I have an odd attitude to this but there is something demeaning and weak about the way the four friends support themselves in this way. I want my heroes to have a bit more pride and self-respect than that. Although I appreciate this kind of behaviour is necessary to enable the plot of The Three Musketeers to progress, the cavalier way in which the queen treats France is unsettling and the seeming disregard of the king for her political treachery is breathtaking. The king, in particular, comes across as immature and jealous. Let’s put this in context: Buckingham was the King of England's Chief Minister. France was one of England’s chief foes at the time. A successful rebellion by La Rochelle, one of the French navy’s key ports, could have done serious damage to France. Yet Buckingham was prepared to refuse assistance that they had requested because he fancied the Queen of France. I suspect this verges on the treasonous. The real story, of course, is not the same as this. The characters also have an overweening obsession with their appearance and image and, consequently, I am finding them to be selfish, vain and immature. My negative impression of them has largely erased my previous enjoyment of the book. I am starting to think that The Three Musketeers will turn out to be a book that should have stayed as a childhood memory. It may be that I am a bit too old, a bit too jaded, even a bit dull in my middle age. I haven’t refound the pleasure of my earlier experience with the book and, as I start the second half of the readalong, I am hoping that things will change but have my doubts. I agree to a large extent-these men are supposed to be admirable but they're so hot-tempered and contrary to what my notions of honor are. I do however feel for Anne and I'm not a big Richelieu fan so I don't really care that she wants him gone. I agree, the morals are pretty questionable. I see them a bit as caricatures and not real people. I never read it as a child but saw the 1970s movie with Michael York, and I don't really remember much of the moral implications. Maybe the film really downplayed that aspect. I might have to watch it again. I never saw the 1990s film version but now the idea of Charlie Sheen as Aramis is just laughably ironic. I do think its funny that I think I really know the story without really having read it before. Funny how that works in some cases. I completely see where the morals are questionable. I mean, really guys, you're going to mooch off everyone around you and call yourselves respectable? It was a little hard for me to come to terms with the fact that these guys were respected in their communities, but they seem to be a little slimy. And that everyone around them is okay with that! But I'm still finding it enjoyable (if at times a little ridiculous that they fight over EVERY LITTLE THING). What I really want to do now is watch one of the films to see how they portray these characters. It has been a long time since I've seen a film version, and I think it would be an interesting comparison. I hope the story picks up for you! Thank you for participating! This was a very interesting post, a deep look into an old favorite. I'll look forward to your further thoughts in Part 2.